The London Green Party on their website here is encouraging their members and supporters to vote for Jenny Jones as their first choice candidate to be Mayor of London and to use their second preference vote to support Labour candidate Ken Livingstone. This left wing alliance makes perfect sense to me to counter the right wing Tory Liberal alliance. 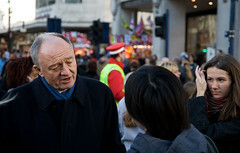 Posted on March 28, 2012 March 28, 2012 by Cllr Krupesh HiraniPosted in LondonTagged Green, Green 2nd preference, Green Party, Green second preference Ken Livingstone, Jenny Jones, Ken, Ken Livingstone, Labour, London, London Green Party, London Mayor, Right-wing politics.